These are pictures of our newborn daughter’s diapers. 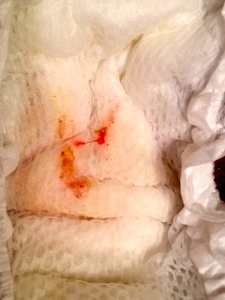 She had a small amount of bright, red blood from her vaginal area between day of life #4 to #6. Is this common? Three percent of newborn girls are estimated to have visible vaginal bleeding in the first week of life. According to one study, the peak day for bleeding is the fifth day of life. These “mini-periods” are due to the sudden withdrawal of maternal hormones (specifically estrogen). Her bleeding is likely normal and should resolve without treatment. I would recommend she be evaluated by her doctor. 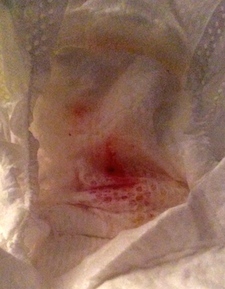 Huber, A.“The frequency of physiologic vaginal bleeding of newborn infants.” Zentralbl Gynakol. 1976;98(16):1017-20.